Sensitive skin can affect the quality of life, leading many consumers to look for simple, effective solutions of healthier skin. With increased exposure to environmental factors, like pollution, UV radiation, extreme climate change and more, individuals report exaggerated skin reactions. There are several different pathologies that can be included under the umbrella of “sensitive skin”. These can initiate an inflammatory process that will produce redness, itching and other symptoms. It is a multifactorial problem that does not have a unique solution. in lipids and keratin, our skin is an effective barrier against undesirable substances. However, with age or loss of hydration, this composition breaks down, leading to a less effective barrier. 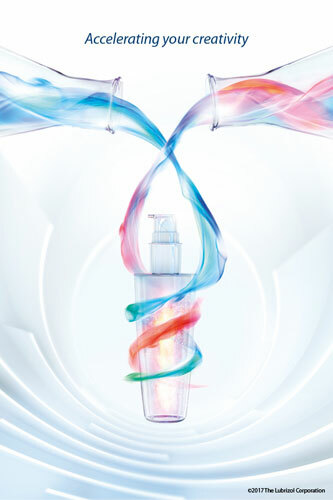 There are several cosmetic ingredients, (i.e. fragrance allergens, formaldehyde donors, preservatives, sunscreens) that can produce allergic reactions. Other chemicals can lead to skin sensitization, producing irritation instead of allergic reactions. An example would be surfactants. Although they are widely used in the formulation of cosmetics to clean or to stabilize emulsions, they are sometimes,being perceived negatively due to potential skin irritation. Pemulen™ EZ-4U polymeric emulsifier, the newest member of the Pemulen™ series, is an extremely easy-to-use ethoxylated-free polymeric emulsifier. It can be used in hot or cold processed formulations and disperses directly into agitated water in as little as 5-10 minutes, ultimately, saving energy. It is also an extremely high-molecular weight molecule. Since it is believed that molecules with a molecular weight higher than 500 Da have reduced skin permeation; formulating with Pemulen™ EZ-4U polymeric emulsifier minimizes the risk of skin permeation, allowing the formulation of products with a very high margin of safety. One of the main differences between Pemulen™ EZ-4U polymeric emulsifier and the traditional emulsifiers is surface activity. The World Customs Organization defines organic surface active ingredients as the product that, when mixed with water at 0.5% and 20°C, gives a transparent or translucent liquid without separation of insoluble matter. This reduces the surface tension of water to 45 mN/m or less. 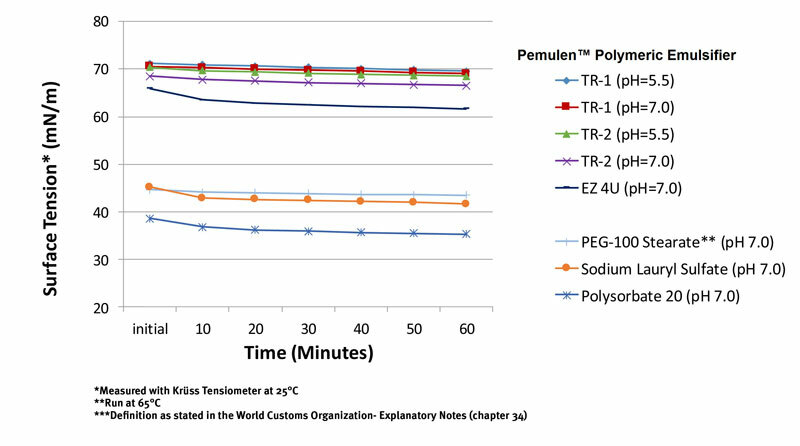 Pemulen™ EZ-4U polymeric emulsifier as shown is Figure 1, is not able to reduce surface tension below 45 mN/m. Pemulen™ EZ-4U polymeric emulsifier does not interact with the lipids of the stratum corneum as compared to traditional emulsifiers, hence not disrupting the skin barrier. Figure 1: Surface Activity of Pemulen™ Polymeric Emulsifiers vs. Traditional Emulsifiers measured at 0.01% in water. When it comes to formulating mild, refreshingly smooth emulsions, you don’t have to sacrifice quality for ease of formulation. Choose Pemulen™ EZ-4U polymeric emulsifier from Lubrizol Skin Essentials and get it all.